Carp are not the most attractive fish in the lake, and many anglers actively dislike them. They are considered a nuisance and worse because they eat the eggs of other fish and they are constantly stirring up the mud in the shallows, which also interferes with the spawning processes of other fish. Adult carp feed by sucking up mud then spitting it out. This lets them select the bits they want to eat while everything is floating around. The females can deposit up to a million eggs a season, but the average is about 300,000. Still, that’s a lot of eggs, and they really roll around during the spawn, so they make quite a commotion that you can hear from a long way off. Carp don’t endear themselves to many, so naturally people have often tried to get rid of them. About the only good way to do this is to poison the whole lake, then put back only the “good” fish. On the up side, carp are a major food source just about everywhere in the world except North America. Most of us think they taste like mud. But still, there are some die-hard carp fishermen in America, and some of them even insist on catch and release! Others kill every carp they get their hands on, and one of the more popular ways to go after carp is bowfishing. Bowfishing combines hunting and fishing. You can bowfish from shore, but most bowfishermen hunt from a boat. Some of them are rigged up with elevated platforms that make it easier to see into the shallows. All you really need is a bow and a way to prowl shallow water quietly. It doesn’t take a lot of equipment to become a bowfisher. There are no legal poundage restrictions for bowfishing, so it’s an ideal sport for kids, and you don’t have to invest in expensive gear when you first start out. You can use whatever bow you like, even a crossbow, but a recurve bow is usually easier, especially when you’re just starting out, because you don’t have to draw it all the way back like you do a compound bow. You’ll also need a big reel spooled up with at least 80-pound-test braided line. A big Zebco 808 or 888 is ideal, and you should mount it on a stabilizer. You can find all the equipment you need at a good sporting goods store like Sportsmans Warehouse or in the Bass Pro or Cabelas catalog, and don’t forget the eye protection. Good sunglasses will not only protect your eyes, they’ll make it a lot easier to see into the water. There are many different arrowheads to choose from, but one of the more popular ones for carp is Sure-Shot. This is a round arrowhead with prongs that reverse with a simple twist, so they hang on while you reel the fish in, but come out easily as soon as you want them to. Fiberglass arrows are more durable than aluminum for bowfishing. They’re heavy and slow, but they do the job. You might be thinking that the line is tied to the end of the arrow, but NEVER do that. When you release the arrow, a trailing loop of line can tie itself to the bowstring and snap back. You can get seriously hurt doing that. You should always use a cabled arrow or a safety slide to keep the line in front of the arrow rest. Once you’ve got yourself outfitted, you need to find carp, buffalo fish, tilapia, goldfish, or shad to shoot. They’re all legal for bowfishing, and carp in particular are easy to find. Old Bugle Lips (as they are fondly called) reside almost everywhere in Arizona where there is water. The Game and Fish Department calls them “under-utilized” and is really happy when they can get people to take them. 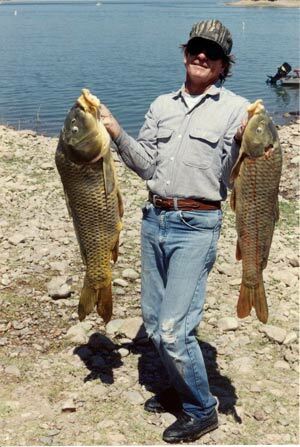 Jim Warneke (Mesa office of G&F) even holds “Camp Carp” every summer at Apache Lake to try to stir up interest. Roosevelt, Apache, Saguaro, Pleasant, Canyon – all of these lakes have carp. Roosevelt and some of the other Salt River lakes are good for buffalo fish, too. Alamo has tilapia, and the Colorado River lakes are loaded with carp. December and January are good times for tilapia. They start to die off then, and they come up shallow where you can get to them. Check the Fishing Regulations booklet to find bowfishing waters near you, and remember that you do need a fishing license to take carp. Stealth is key when you’re bowfishing. Use the trolling motor only when you have to, and keep the boat in the shallows. Try not to let your shadow fall across the fish. If you spook one, hang around. They often come back. Last but not least, remember that refraction will make you miss if you aim right at the fish. Aim low and let go. What to do with your carp once you’ve got them? Well, you can eat them. Jim Warneke has several recipes you can try. They also make very good fertilizer if you hack ’em up and dig them into the ground. Camp Carp will be held May 5 and 6 this year, at either Roosevelt or Apache Lake. All you have to do is show up, and you’ll have a blast. The Game and Fish guys will teach you how to catch carp, and they’ll probably even cook some for you. Call (480) 981-9400 to reach the Mesa Office of the Game and Fish Department, or log on to www.azgfd.gov for more details.